Just like the other major components in your vehicle, the axles occasionally need attention and servicing to help you stay safe on the road. 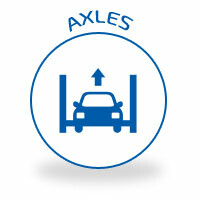 Regular maintenance can prolong their life, but axles eventually need to be repaired or replaced. Regular maintenance for your vehicles axles include cleaning and lubrication of the axle, shaft, CV boot and seals. But with age and miles, these parts may wear out and leave your vehicle at risk for bigger issues. From leaking seals to gear damage, small problems with the axles can mean big issues for your vehicle. Unfortunately, there is no warning light to easily identify this issue. Instead, you may notice strange noises. Clunking and groaning, especially when turning, signal a problem with the vehicle’s axles. At the first sign of an issue, bring your vehicle to Melton Automotive! Our certified technicians will inspect all of the system components that might be causing the problem, including the axle, shaft, CV boot, and seals. With this thorough inspection, our team of certified technicians will find the issue and recommend repair, replacement, and installation of new parts if it is necessary. Don’t ignore strange noises – these changes may indicate a problem with the axles in your car. Bring your vehicle into our Alabaster, AL auto repair shop for diagnosis, repair, service, and maintenance. Our technicians will get your vehicle driving smoothly and safely again! If you have questions about a change in your vehicle or suspect a problem with your axles, call our experts at 205.663.6088.